Herbalist and proprietor of Aquarian Bath, Cory Trusty, shares with us how to make fresh herbal boutineers and corsages for the Holidays! 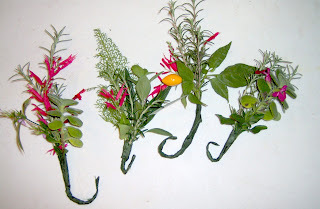 You can make fresh herbal corsages or boutineers with Rosemary and other evergreen herbs and shrubs from your yard or neighborhood. Rosemary is one of my favorite herbs for the holidays, but these kinds of arrangements with other herbs as well. 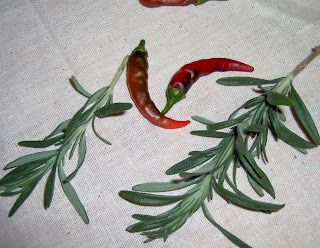 I've just been having fun with rosemary and red pepper. You just need a few tools. 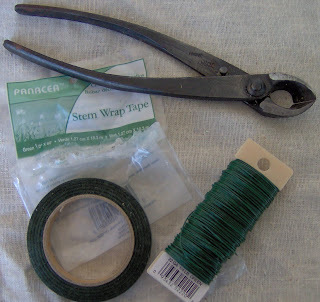 You will need wire snips, florist tape and florist wire. You can get these from a craft store. 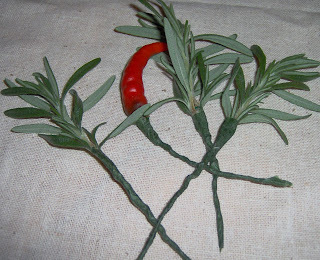 I choose herbs with fairly sturdy stems, but you can also use herbs with more delicate stems if you wrap them together with sturdy stemmed herbs. Strip the foliage from the bottom inch or 2 of the stem. Poke a hole through the the green tender part of the herb stem and wrap the wire around the stem to stabilize it. Stretch the tape and start wrapping it tightly at the base of the plant and continue down to the end of the wire. Once you have the stems wraps you can combine them together however you wish. Finish by wrapping them all together with a new piece of florist tape. 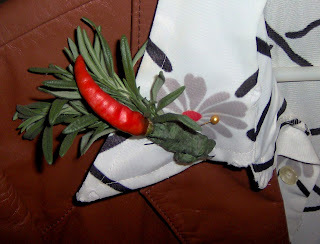 Here is a simple Rosemary and Hot Pepper boutineer. 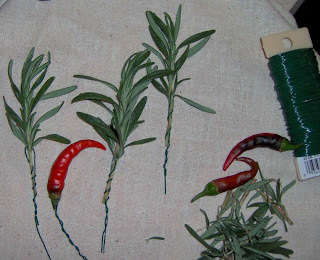 You can also make and hanging ornament, a small wreath or corsage with additional herbs of your choice. ~ Cory Trusty, soap maker and herbalist, resides in Daytona Beach, FL. You can find more items for the Holidays by visiting her shops AquarianBath and DelicateAdornments.